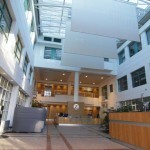 Zurich Insurance have operated out of the 36,500 sq ft Ballsbridge facility since 1991. 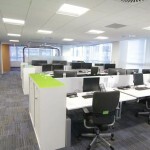 With the services within the office space reaching the end of their useful lifespan the decision was taken to completely refurbish the office facility. 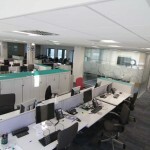 The office refurbishment project offered a number of opportunities to bring the facility in line with current business goals. 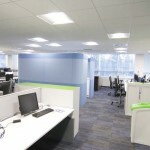 This included reduction in carbon footprint to meet energy savings targets. The overall project was completed while staff remained within the facility. It included stripping each of the floors back to shell status. It also involved installation of all new finishes in line with the new layouts. 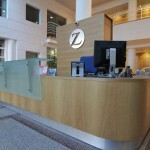 These were prepared to meet the needs of Zurich’s Dynamic workplace platform which provided for open plan meeting spaces as well as the traditional enclosed spaces. 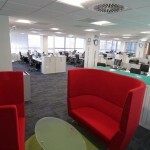 All of the existing finishes within the office space were removed and new services were provided to all areas. This included new VRV air-conditioning with fifty percent more efficiency that the previous systems. Also provision of a new LED lighting system that is currently providing 80% reduction (certified) in power usage.The LED lighting system is an intelligent system that runs off CAT 6 data cabling and removes the need for power installation in the ceiling void. The power services were repositioned to match the new layout. The overall space received new finishes to walls ceilings. 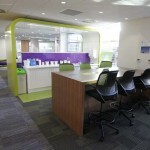 The space was fitted with double glazed partitions in a demountable system and new workstations throughout. 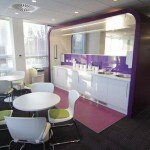 The tea stations were integrated into the open plan area and turned into a feature piece. 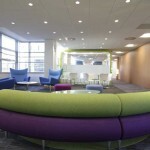 High level benching was also used to provide staff with group meeting spaces. 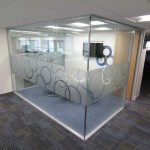 Printing services were enclosed in a fabric pod area again within the open plan area. "The service and the attention to details has been second to none. Creative Space services technical background and ability to liaise with our staff in providing for their requirements have proven to be a major advantage in the ability to deliver projects not only on time but also within strict budgets .The contribution to our businesses is much appreciated."